The CAiSE Forum is a place within the CAiSE conference for presenting and discussing new ideas and tools related to information systems engineering. Intended to serve as an interactive platform, the forum aims at the presentation of emerging new topics, case studies as well as demonstration of innovative systems, tools and applications. The Forum sessions at the CAiSE conference will facilitate interaction, discussion, and exchange of ideas among presenters and participants. The CAiSE Forum welcomes all submissions that fall in the domain of information systems engineering and the CAiSE conference topics. The special theme of this year’s conference is Creativity, Ability and Integrity in information Systems Engineering. Other main subject areas are: New generation IS engineering, Multi-aspect IS, Architectures and Platforms, Models, Methods and Techniques in IS Engineering and Domain specific IS engineering. Visionary short papers: papers that present innovative research projects, which are still at a relatively early stage and do not necessarily include a full-scale validation. We specially encourage submissions by starting PhD students. Demo papers: short papers describing innovative tools and prototypes that implement the results of research efforts. The tools and proto-types will be presented as demos in the Forum. Case study reports: Reports on real world cases, using the STARR (Situation, Task, Approach, Results, Reflection) template. Submission Conditions: Forum papers should be submitted in PDF format. They must not exceed 8 pages in LNCS format. The submitted papers must be unpublished and must not be under review elsewhere. Submission should be made through the conference management system available at this page. 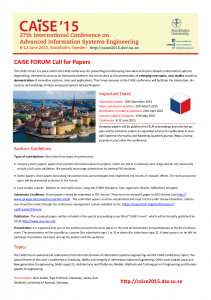 The accepted papers will be included in the special proceedings issue titled “CAiSE Forum”, which will be formally published by CEUR. Selected papers will be invited to submit an expanded version for publication in Complex Systems Informatics and Modeling Quarterly journal after the conference. The proceedings will be submitted for indexation by Scopus and DBLP. Presentation: It is expected that one of the authors presents the short paper or the tool demonstration and participates at the forum discussions. The presentation will be possible as a poster (for visionary short papers and case study reports) or demo (for demo papers). A large space is to be left for exchange of positions and ideas among the authors and the audience.